We loved working on this simple, understated design project. The client had great design taste and was clear on what they wanted right from the beginning, which is always a major bonus for us. This project was fun, fresh and had more spatial planning involved as it was a poorly designed tiny, impractical one bedroom apartment with potential to transform into a much larger and practical one bedroom apartment. We will now breakdown the entire project and show you sneak peaks of the construction process and behind-the-scenes footage of the construction work. Our client was a young couple who are lovers of great design. They both work in demanding jobs but want their living space to be a true reflection of their love for simplistic design. A space where they can come home from work and feel total relaxation. They bought a studio apartment in an auction which was in a complete run down state and in desperate need of some TLC, and had two months to complete the project as they would be vacating their current space. When we were initially approached by our clients they wanted to make the most out of their apartment, but weren't entirely sure how to go about it. They knew the design style they were trying to achieve, but in terms of spatial planning and maximising the given space, this is where they required more expert advice and where we stepped in. They wanted a larger kitchen area and a place where they could sit and eat together, as well as a spacious bedroom and a private bathroom. Why Did Space Shack Take On The Project? We took on this project on because we love small projects like this, where we can explore various opportunities to maximise and propose solutions to enhance the usability of a space. What Was The Initial Space Like? The initial space was extremely run down and dated. As you can imagine, most London auction properties are in this state. However, with many characteristics and a respectable size to be utilised, there was a lot of potential to develop and redesign this small one bedroom apartment into a spacious, practical living space for a young design-savvy couple. 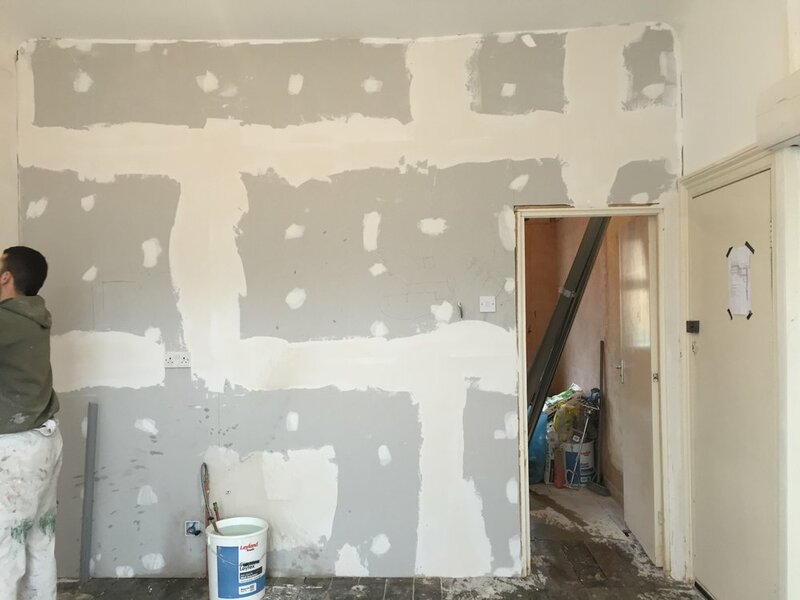 So, the initial space is a tiny one bedroom apartment, we plan to transform this into a spacious one bedroom apartment with an ensuite shower room and an open plan kitchen/living/diner. This could be a challenge given the space, but we are confident this is the best solution as the new layout will dramatically transform the apartment. It is also an ideal spatial layout to making the most of the space whilst retaining different zones so there is privacy when their friends and family visit. We plan to put up a new partition wall which will separate the main kitchen/living area from the bedroom. The bedroom will be a large enough space to house an ensuite shower room, which saves space and doesn't eat into the neighbouring area. By creating these zones we are hope to give our clients more privacy for when guests visit as well as forming a space which is practical and functional. Now you've seen what the space looked like before, I'm sure your reeling to see the finished space. Well you will have to check back next week to see the finished project! Keep up to date with regular projects like this by following us on Instagram and check back on the blog for regular updated posts.